Engineered materials that integrate advances in polymer chemistry, nanotechnology, and biological sciences have the potential to create powerful medical therapies. UCLA professor Ali Khademhosseini’s lab has developed photo-cross-linkable hybrid hydrogels that combine natural biomolecules with nanoparticles to regulate the chemical, biological, mechanical, and electrical properties of gels. These functional scaffolds induce the differentiation of stem cells to desired cell types and direct the formation of vascularized heart or bone tissues. In this webinar, Khademhosseini will discuss his lab’s development and use of hydrogels to regulate cell behavior and the lab's use of microfabrication methods, such as microfluidics, photolithography, bioprinting, and molding to regulate the architecture of materials in order to generate miniaturized tissues. He will discuss directed assembly techniques developed by his lab to compile small tissue modules into larger constructs in order to create tissue complexity. Khademhosseini will conclude with his views on how current work in the area of organ modeling and bioprinting could lead to the development of next-generation regenerative therapeutics and biomedical devices. Ali Khademhosseini, Ph.D., is the Levi Knight Professor of Bioengineering, Chemical Engineering and Radiology and the founding director of the Center for Minimally Invasive Therapeutics at the University of California, Los Angeles (UCLA). He is also associate director of the California NanoSystems Institute at UCLA. He joined UCLA in 2017 from Harvard University, where he was professor of medicine at Harvard Medical School and a faculty member at Harvard-MIT Health Sciences and Technology and the Wyss Institute. At Harvard, he directed the Biomaterials Innovation Research Center (BIRC). Khademhosseini and his group are interested in developing "personalized" solutions that use micro- and nanoscale technologies to enable a range of therapies for organ failure, cardiovascular disease, and cancer. He has developed numerous techniques to control the behavior of patient-derived cells to engineer artificial tissues and cell-based therapies. 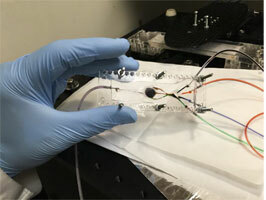 He is also developing "organ-on-a-chip" systems that aim to mimic human physiology and pathology to enable patient-specific evaluation of drug candidates. In addition, his laboratory is a leader in utilizing 3D bioprinting to form vascularized tissues and to direct stem cell differentiation. He has authored more than 550 journal articles and has received over 50 national and international awards. He received his doctorate in bioengineering from MIT, and bachelor's and master's degrees in chemical engineering from the University of Toronto. Researchers, scientists, bioengineers, chemists and biophysicists, as well as educators, clinicians, and others allied to the field of bioengineering. Anyone who is interested in the use of novel materials, devices, and methods for advancing regenerative therapeutics. Read about the 3D printer that Khademhosseini and his group have built to fabricate therapeutic biomaterials.